Try Elsies Hot Diggity Dogs! “It’s tricks like this that make a picnic click,” rhymes Elsie. “And this one’s easy: “Cut frankfurters lengthwise, but not quite through. Spread cut sides with mustard. 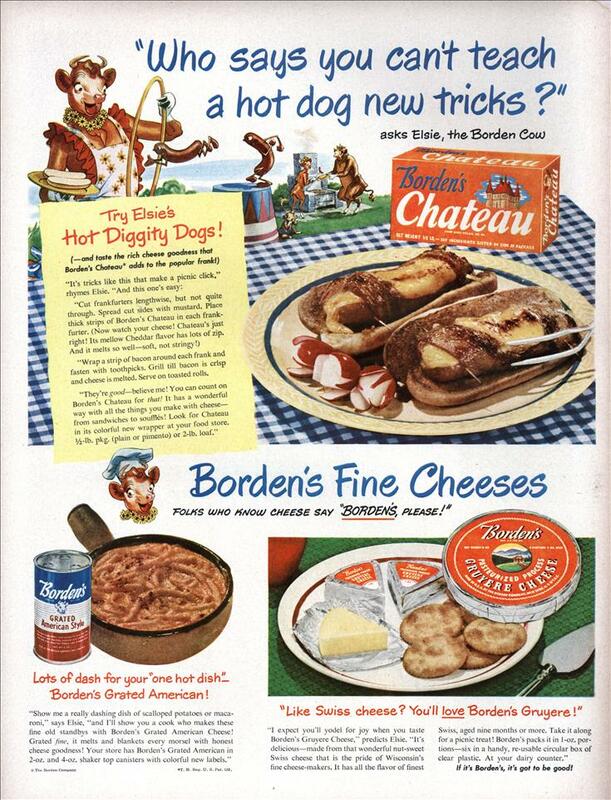 Place thick strips of Borden’s Chateau in each frankfurter. (Now watch your cheese! Chateau’s just right! Its mellow Cheddar flavor has lots of zip. And it melts so well—soft, not stringy!) “Wrap a strip of bacon around each frank and fasten with toothpicks. Grill till bacon is crisp and cheese is melted. Serve on toasted rolls. Lots of dash for your “one hot dish” Borden’s Grated American! If it’s Borden’s, it’s got to be good! Old food ads always look so unappetizing, either the ink colours fade over time at a differential rate or people back then were just used to eating crap. “Old food ads always look so unappetizing” because they are perhaps more realistic than the modern artifice of food styling. In this ad, it looks rather like they really did char the thing on a backyard grill and then plop it in front of a camera. Nowadays they don’t necessarily even cook it, but fuss over it with heat guns, hot irons and spritzers like hair. Not that you could count on realism all the time. “They’re good— believe me! You can count on Borden’s Chateau for that! …” Yeah, you can count on the bacon for that. @ blast – Oh I know about food styling (did you know they use white glue instead of milk in some cereal ads because real milk doesn’t look good enough?) but still this food doesn’t look right , look at that pasta, the bacon, the radishes, the colours just aren’t right. Was this printed on coated stock? Half-toned? Printing technologies changed a lot over the last 80 years. 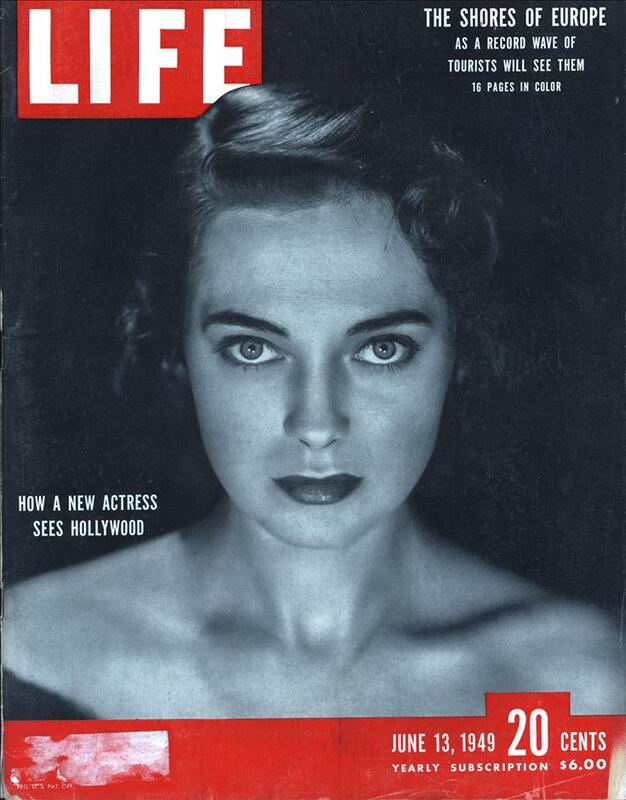 I’m not from the US, but if you gave me a word-association test and said “Borden”, my instant response would be “Lizzie”. Maybe it’s just that Lizzie is the only Borden most people in Britain have ever heard of, but I do hope the company didn’t/doesn’t sell meat products as well.